Previously on Once Upon a Time: Tiny. This week on Once Upon a Time, it’s all about family. In New York, Emma and Rumpelstiltskin find Baelfire and it’s not the reunion that any of them are expecting. In Storybrooke, Cora and Regina bond over their love of evil plans, while Greg continues to meddle. Finally, in the pre-Curse Enchanted Forest, we learn what set all of Rumpelstiltskin’s plans in motion. In the pre-curse Enchanted Forest, a pre-Dark One Rumpelstiltskin has been called to the front of the Ogre’s War, and is eager for the chance to prove that he’s not a coward like his father. At the front, Rumpelstiltskin is left to guard a child Seer, who prophesizes that Milah will bear him a son but his actions will leave him fatherless – and when they ride “cows into battle” he’ll know she speaks the truth. The next night, he’s told they’ll be riding horses – complete with “cows” or saddles (really, writers?) into battle. Fearing death, Rumple breaks his own leg with a mallet so he’ll be sent home. Milah is waiting with baby Baelfire, but she’s disgusted with the shame her husband has brought on the family. After Rumplestiltskin loses Baelfire, he returns to the now-adult Seer for a way to get him back. She foretells of the Curse, and when she’s unable to give more details he takes her powers – only to find he can’t make sense of the jumble. She offers one final prophecy: a young boy will lead Rumpelstiltskin to his son, but will ultimately be his undoing. In New York, Baelfire is not expecting company, prompting Emma to leave Henry with Rumpelstiltskin as she chases down his son and tackles him. Baelfire is none other than Neal. Emma freaks out, and Nealfire freaks out that his father has found him. They take their respective freak outs to a bar. 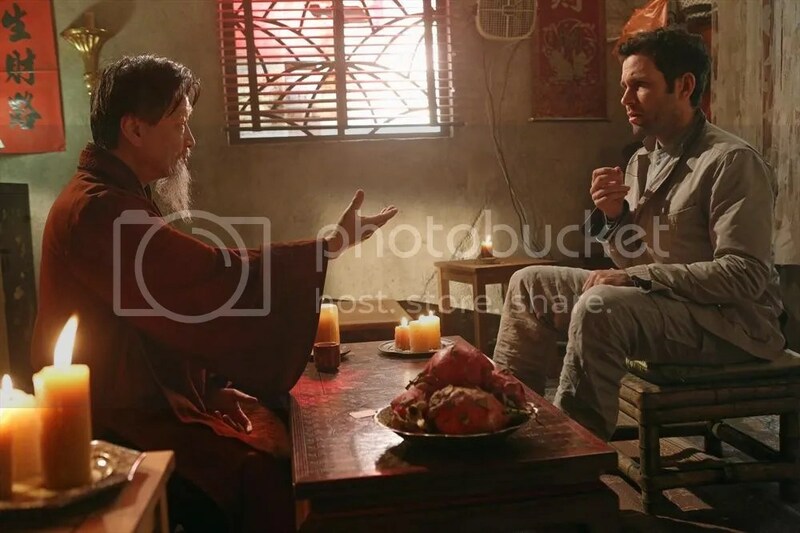 Emma accuses him of playing her, but Nealfire swears he had no idea she was the chosen one until August warned him off (the box contained his typewriter with the message “I know you’re Baelfire”). She still feels manipulated, but he suggests their meeting was fate. Emma returns and lies that Bealfire escaped. Rumpelstiltskin is not willing to give up so easily, and as they search Nealfire’s apartment he senses Emma is lying and they get into a shouting match, and his son appears. All the yelling prompts Henry to emerge from the bathroom, which causes Nealfire to realize that he’s his son. Henry is totally disillusioned with Emma, accusing her of being like Regina for lying to him about his father. Nealfire agrees to hear Rumpelstiltskin out to fulfill Emma’s deal, but nothing his father can say will encourage him to reconcile. 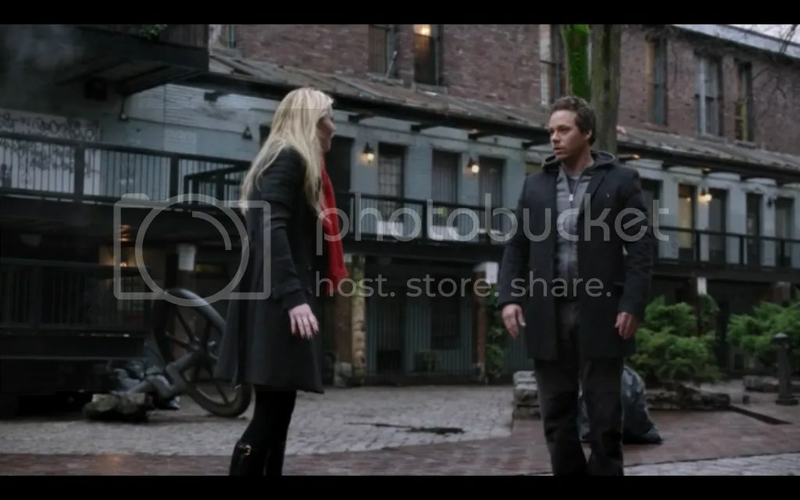 Emma makes Nealfire promise not to break Henry’s heart, and father and son meet for the first time. In Storybrooke, Regina is upset that Henry has left town with Emma. Hook (who along with Regina and Cora can cross the town line without losing their memories, since they weren’t victims of the curse) wants to follow Rumple to New York and finish him off while he’s powerless, but Cora would rather use the opportunity to get his dagger and destroy him that way. Regina visits Belle in the hospital and despite having two good hands she uses magic to search Belle’s purse – solely as a plot device so Greg can record the whole thing on his phone and send it to “Her.” A note from the purse leads Regina, Cora, and Hook to search the library. They find a map that Hook deciphers, after which they knock him out and leave him behind. Regina worries that her mother is only after the Dark One’s power, but Cora says the dagger will allow them to control Rumple and use him to remove all obstacles to Henry. Next week, Hook heads to the Big Apple for his revenge. • Dear Show, I love it when you prove me right and make me happy. Love, Me. I’m SO EXICTED that Neal is Baelfire! Now that he’s being thrown into the mix I’m really excited to see how this convoluted family dynamic develops. • Speaking of family, I can’t believe that Regina is actually going to go along with Cora’s plan. After all, Regina saved Emma and Snow only a few episodes ago – I doubt she would break Henry’s heart like that. • Knowing what we know now, I wonder if Rumple’s ability to see the future and the Seer’s prophecy had anything to do with him bringing baby Henry to Regina. Nicole N. decided to justify the countless hours she spends watching television by writing about it here. She is currently upping her political savvy by watching all of The West Wing. For more tv-centric musings, check out her tumblr.